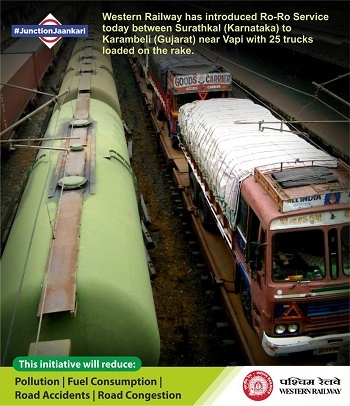 Western Railway has introduced Ro-Ro service between Karambeli (Gujarat) near Vapi and Surathkal (Karnataka) on 21st September 2018. The rake was loaded with 25 trucks. It will reduce pollution, save environment & fuel and also will reduce congestion on roads.